Where just 20 years ago religion was a huge part of our North American media culture, today it has been all but replaced by movies and television programs on the supernatural – psychics, mediums, spiritism, ghosts hunters, vampires, zombies, witchcraft, magic, illusions and other various forms of the occult have seemed to capture the minds of both youth & adults alike. 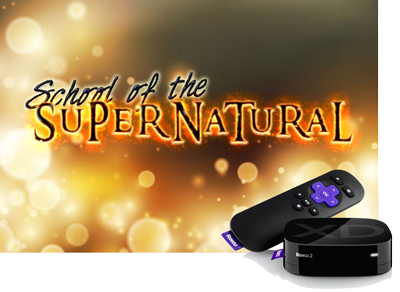 Whether you consider yourself to be a novice or well versed in things of the supernatural, we encourage you to join our Roku Channel: SCHOOL OF THE SUPERNATURAL, where I promise you that you will see & hear things you have never before! Roku: “School of the Supernatural” offers you a behind the scenes look beyond the veil of the spiritual dimension from individuals who encounter the supernatural on a daily basis. You will meet some of the most qualified leaders in the world to teach you about the greatest source of power you could ever hope to encounter! Get on your Roku device and go to: Settings — > System –> System Update.